ID8 is the songwriter's toolbox. The ID8 Instrument Device ships with a wide palette of sounds useful for building a steady foundation for your tracks, like pianos, drums, bass, strings and more. The ID8 contains 36 presets divided into nine categories, with four sounds in each category. The Piano category features a grand piano, an upright piano, a dance oriented piano sound and vibes. The Electric Piano category holds two classic electric piano sounds plus a digital FM type piano and a Clav. The Organ category contains two classic tone-wheel organ sounds, one transistor organ sound and a pump organ. The Guitar category sports an acoustic steel string guitar, a clean electric guitar, a half-acoustic jazz guitar and a dulcimer. The Bass category features one fingered and one picked electric bass, an acoustic upright bass and a synth bass. The Strings category holds orchestral strings, arco strings, a small string section and a choir sound. The Brass-Wind category features Fat Brass, Brass Section, French Horns and Flute. 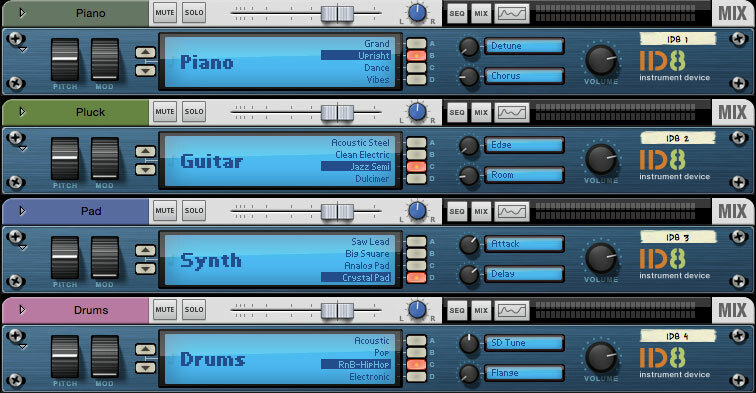 The Synth category contains two classic monophonic synth lead sounds and two characteristic polyphonic pad sounds, one with fast attack and one with slow. The Drums category sports four extensive combinations of drums and percussion instruments aimed at different musical styles. Each “drum kit” contains between 53 and 65 different instruments, so there is plenty to choose from! The ID8 device is used by default when you're loading a Standard MIDI File into the Reason sequencer. For every MIDI track in the imported file, you will get an ID8 device loaded with a sound that resembles the original sound. This serves as a starting point to be able to play back the imported MIDI file. However, you could of course change sound, or replace the ID8 with another instrument device afterwards.